Asthma is the most prevalent cause of childhood disability in the United States according to the American Asthma Foundation. It is a condition that is especially common and growing among Boston’s low-income communities. Cohen wants to make sure these fragile kids don’t fall further behind and is spearheading new ways to change asthma care. Central to these efforts is an emphasis on comprehensive and streamlined care, education and communication—both in the clinical setting and at home. The standard for each child with asthma is to have appropriate medication and an asthma treatment plan to guide which medication to take and when. While it may seem straightforward, asthma is quite complex; and understanding and managing asthma can be challenging for families. That is where asthma educators step in, helping families learn about their child’s asthma with an evidence-based curriculum tailored to their specific needs. From educating families about what asthma is to understanding triggers and medication types, educators will spend as much time needed with families to guarantee their comfort. Equipped with education, Cohen and her team also want to make sure there are no barriers to obtaining the right medication. Thanks to medication delivery services—including home delivery and hospital bedside delivery—families do not have to worry about how they will travel to the pharmacy. “Families don’t always have reliable transportation, or are working multiple jobs,” says Cohen. “Getting the medications to the families ensures there are no gaps in the treatment between the clinic and the medication patients need to take at home.” Pharmacy liaisons call families each month to inform them a new shipment is on the way. An added benefit of conversing with families on a monthly basis is uncovering issues at home. Concerns about appropriate medication use are shared with a nurse or doctor for follow-up. These other issues include mitigating the environmental triggers of asthma such as exposure to second-hand smoke dust, and substandard housing with mold and pests. 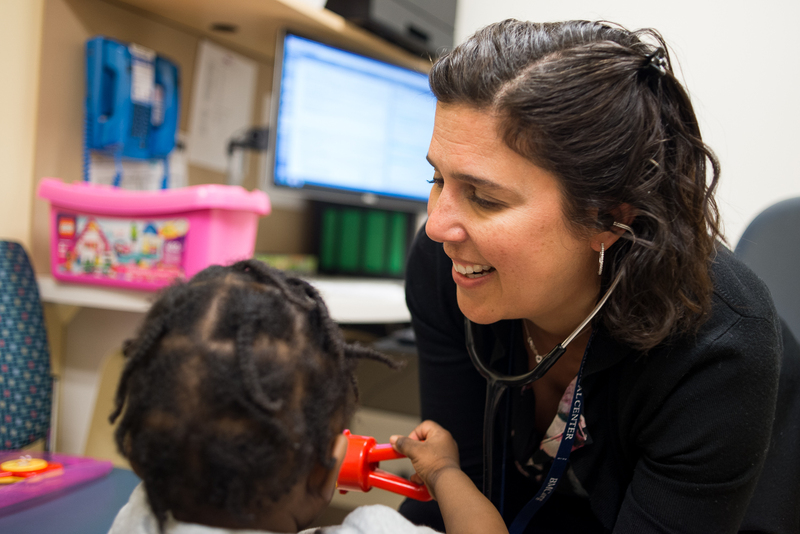 The pediatric pulmonary team harnesses resources that can provide families with extra support at home. A referral to Boston Public Health Commission’s Breathe Easy Program provides patients with in-home counseling to help further reduce asthma triggers. When dealing with a negligent landlord, the Medical-Legal Partnership, a program founded at BMC, can also step in to help families understand their rights as tenants. Beyond environmental factors, Cohen notes that many of her patients are also under significant psychosocial stress. Since stress and asthma attacks are sometimes linked, Cohen has teamed with a speech pathologist in the Department of Otolaryngology who promotes relaxation with breath training. Breathing techniques put control back into the hands of the patient, and families are very receptive to treatment techniques that go beyond medication.